Back-to-school anxiety is a real thing. As adults, it is easy to brush aside. As a kid, it isn't. Fear of who will be your teacher, in your class, where the bathrooms are, and if you'll even get on the right bus are so prevalent that other behaviors may start to emerge that never once did. This whole gamut of emotions that a child carries within them may make them seem as moody as Judy! A super-simple way to handle this, alongside healthful talking about it, is to read a book. Splat the Cat became my go-to as this funny, fuzzy feline has some very real emotions children were incredibly familiar with. Below, and linked where possible, is a small but very powerful list of great books that tackle this subject in some very eloquent, funny, and even serious ways. Enjoy and let me know your own thoughts on your favorite ways to combat anxiety around this once-a-year event. Almost a month ago, Nate and I strolled into the town of South Lake Tahoe, California, to do some mountain biking on the intricate trail system that the city is famous for in the summer time. In typical Nate and Kate fashion, we had NO idea where we were going to park The Monster and time was running out that first night. 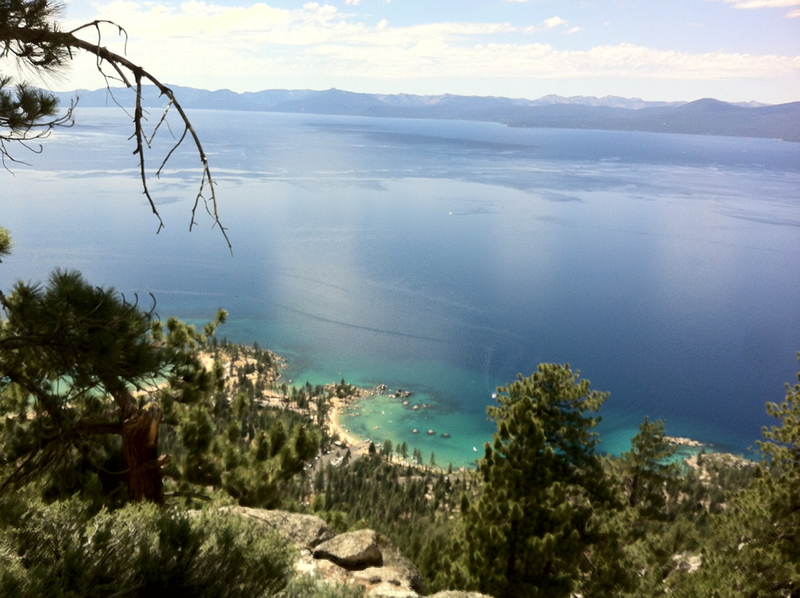 Lake Tahoe as seen from the historical Flume Trail - Nate and I rode our mountain bikes along this lovely trail! On the main drag through town, Lake Tahoe Boulevard, there are umpteen number of signs for camping, cabins, and lake houses. All of these Nate and I know too well – must have reservations. So, imagine my surprise when we saw a small sign that said “Library Rec Center Campground” amidst all of these other signs where we knew we’d be turned away. We thought we would give it a shot – I mean, what kind of campground has a public library right next to it? ONLY THE COOLEST ONE ON THE PLANET!!! Walt and Rich - our two "Papa Bears" that kept watch over us in Tahoe. Campground-By-The-Lake is everything it’s name implies. Steps from the south shore of Lake Tahoe, it is a rustic campground complete with bathrooms (yay for the showers; wear flip-flops, though! ), wonderful hosts (Yay for Walt, Teri, Rich, and Roxie! ), and a LOT of pine trees. In fact, there are so many pine trees that this park is largely shaded from the main drag which borders its western edge – this is a GREAT thing when you are a last-minute travelers like us. Not only were we able to find a spot to park in for the night when we first strolled into town, we ended up staying for close to 2 weeks because there was space for us. Now, back to that library – it was JUST OVER THE FENCE! Nate and I ended up popping over there many a day to get some work done and as such, I started to get to know the librarian. Finally I got the nerve to ask her if I could do an abbreviated author event in exchange for the chance to sell my book and grow confidence in this type of venue. She jumped at the chance! And though we had to present my situation to the final board of decision makers, the Friends of the Library Association, I was quickly on my way to visiting the fabulous library in a capacity where I could give back. Here I sit at my very first author signing and reading of "The Invasion of the Cavity Creatures"! I was SO nervous that morning that a little bit I cried, hence the puffy eyes! One week later, 20 books in hand, plus bookmarks, coloring pages, and stickers and I set up shop to give a wonderfully intimate presentation to 7 kids and 5 parents about how taking just one day off from brushing can start a plaque plague of enormous size and lay the groundwork for Cavity Creatures of all sizes to invade Tongue Town and the Molar Mountains. I never thought this day would come. Honestly. When you self-publish your own books, and a children’s book to boot, you are also in charge of self-promoting, self-marketing, and self-motivating yourself. Hah! That can be scary. Now I know it is possible and one just has to A-S-K to G-E-T and get I did –a wonderful new relationship with an amazing librarian in one of the most beautiful towns on earth. Make sure to stop by and when you are there, check out “The Invasion of the Cavity Creatures”, literally! As an educator, one of the biggest hurdles we face when getting back from summer is re-establishing responsibilities for children. Summertime is for fun, right? Of course it is. However, a little work to maintain your child's accomplishments in his previous classroom can go a long way to making the transition into school work well for everyone in the next year easier. Here's a simple plan I've told parents about in the past who have then given rave reviews of it's ease. It isn't much and it's simple to implement. Find a fun, exciting, easy workbook (these are among my favorite; do NOT give them next year's grade level workbook unless you want a frustrated child this summer). Place the workbook next to your kiddos bed, on a table, or the floor in their room with a pencil of their choosing - same place each day is key! When they wake up in the morning, they can work on two-three pages of their choice. Have them show you the page(s) they completed. For work done correctly, reward your kiddo with a sticker (trust me, these workbooks take a quick glance to know if something is amiss; you can do it while you stir the scrambled eggs). Set a goal of so many stickers = a movie ticket/extra t.v. time/extra play time etc., etc. Fulfill the reward once the goal is met - no take-backs! The end result is three-fold: happy child because they accomplished something on their own towards a goal, happy parent because you can see how smart your kiddo is, and happy teacher because s/he now has a child who's brain isn't a raisin at the start of the school year.